When it came to what I packed & what I actually wore on the honeymoon, I gravitated more towards light, flowy, easily dress-up or down-able pieces. Like these fab palazzo pants + this light weight & fun dress. I also think this night was the only time that I put on jewelry - when you have a new stunner on your finger & a smile from ear to ear, there really are no other accessories needed. By day, beach cover up, by night, pretty dress for dinner at the hibachi grill… 'cause a girl's got to look cute! Don't forget - White Plum has all the cute pieces you will want for Summer…. AND White Plum is hooking up Here&Now readers with affordable Summer style. Enter HEREANDNOW20 at checkout for 20% off your entire purchase (valid until 6/14)! Adorable dress! 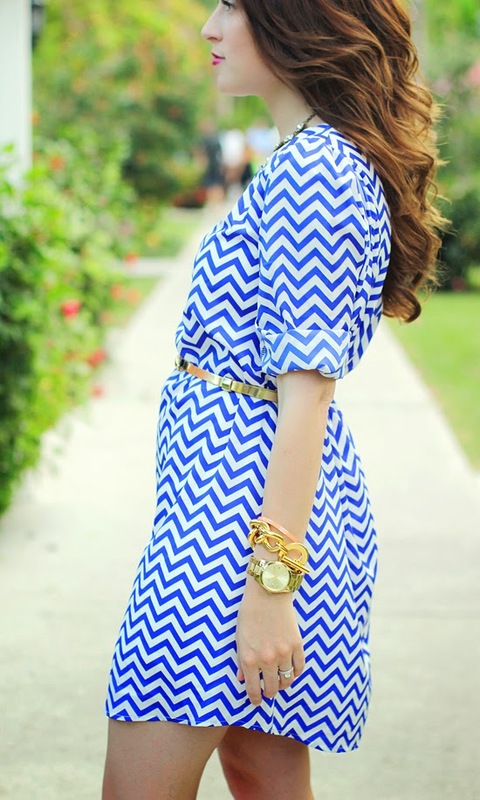 I love the vibrant blue and the accessories make the outfit PERFECTION. I love the brightness of that dress! Gorgeous Jess! This dress is gorgeous and your hair looks perfect! You look totally gorgeous! Love the makeup and the gold accents :) Flowy dresses like this are vacation perfection! Your hair looks beautiful! The color really pops over that blue. I hope you had an incredible time during your honeymoon! I absolutely LOVE this look and how you styled it with the gold accessories- super cute and fun! Very cute dress and I just love those sandals! I hope you had a wonderful time during your honeymoon...xo! Loving all the gold with the blue...such a great combo! Those shoes are absolutely gorge. i love that dress and gold belt! this dress is so darling! I am loving this dress! I think I might head over to White Plum and get one for myself! love all your gold jewelry with this outfit. I am loooving your honeymoon outfit pics lady! You are glowing and you cannot beat these backgrounds!! 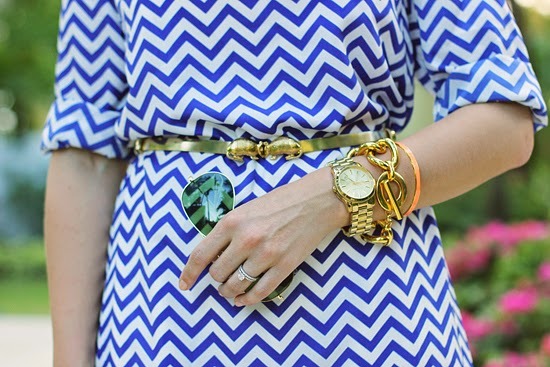 The gold accessories are such a great combo with this dress! Light and breezy is perfect for a vacation! There's something about vacation that makes me not want to fuss with jewelry. A cute scarf maybe but I don't usually care about jewelry to much. That dress looks AMAZING on you and goes so well with your gold accessories. Is this still going to be wedding week?? Can't wait to hear all about it! stunning! 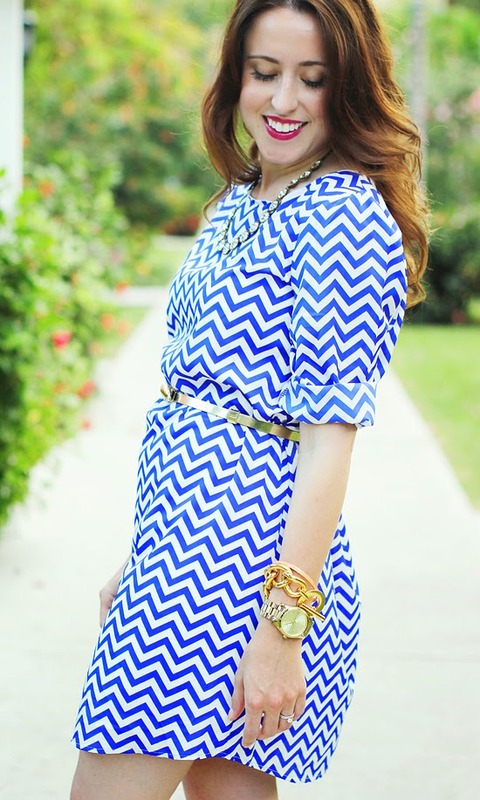 love the chevron pattern! xO! that belt is funky & I love it! That dress is adorable! Love it! This is so cute! You've officially sold me on a gold belt! The ones I've had previously have peeled so quick, so I'm thinking it might be time to invest in one with a little more lasting power, like this Kate Spade one! I love the blue/white pattern! And your lipstick goes with it perfectly! I've definitely experienced the cheap metallic belt peeling, but this Kate Spade one is going on 3 years of major use and still looks like new! I hope you find one of your own! Do you take all of your own photos? They are gorgeous! Cute! I love all the gold details! Though I'd have to agree, if even in that situation, I'd probably want all the attention on the ring as well! ;D haha But you look pretty nonetheless!